BioWare wants you to play Anthem game with your friends. 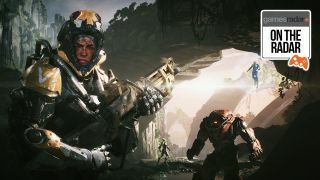 The entire game has been built with this in mind; Anthem is designed to push groups of players together to explore a world on the brink of collapse. Small teams of Freelancers, each making use of a distinct and heavily customisable Javelin exo suit, battle against a range of threats that are steadily emerging out of the Void of Creation. BioWare wants you to play Anthem with your friends, but it’s also aware that sometimes that simply won’t be possible. Over the next two weeks, GamesRadar is delivering all of the information that you could ever need to know about Anthem. The On The Radar: Anthem hub is where you will find all of our in-depth and exclusive coverage of BioWare's latest. What he’s saying is that every time you complete any type of core activity in Anthem – a Story Mission, Contract, Stronghold, or any one of the litany of objectives you can find in Freeplay – you should expect to earn a little Alliance XP for your efforts. You’ll see this reflected at the end screen of a mission before you are booted back to Fort Tarsis, and can be later be tracked through the menus too. The Alliance System is basically a social club for freelancers, complete with various reward tiers that reset week to week. In Anthem, you will have the opportunity to form alliances with your friends which essentially creates two pools of potential XP gain – a personal pool and a social one too. As you earn Alliance XP by playing the game you will begin to move through Alliance Tiers, which will steadily earn you Coin as you do, although you can also earn a bonus Coin payout at the end of the week – this comes from a shared social bucket that is filled by the five buddies on your friends list that have played Anthem the most during any given week. Coin, in case you haven’t been paying attention, is Anthem’s currency that can be used to purchase cosmetic elements such as armour pieces, shaders, emotes and more visual identifiers for each of the game’s Javelins. BioWare’s plan here is to ensure that players are constantly being rewarded for just playing the game, with enough Coin coming your way that you never feel pressured into opening up your digital wallet and paying for Shards – Anthem’s premium currency, also used to purchase cosmetics – unless you really, really want to. What this all means is that no matter who you are playing Anthem with, you will never be held at arm's length from its rewards. If you can get together with friends to explore the world of Anthem, you’ll of course find your pockets lined with an extra helping of Coin week to week, but those of you that are either determined to go at it alone or content with playing with random players should also be happy to learn that you’ll still be earning resources that you can put into making your Javelin look awesome. The studio has been suspiciously quiet on the Guild and Clan front, which has led many players to wonder whether Anthem would incentivise broader social play at all. Thankfully, the studio has finally revealed one of the ways it will reward Freelancers for playing together, both directly and indirectly, by way of its Alliance System. "“We understand Guilds play a critical role in helping players form organized groups with people of similar interests and play styles." Given the studio’s history with the MMO genre, with Star Wars: The Old Republic, this is admittedly a little disappointing. Guilds and Looking For Group systems can help to ensure that all players are able to see the very best content a game has to offer; ask any OG Destiny players that missed out on Raids how it feels when such a system isn’t in place – it isn’t a good time. Thankfully, BioWare believes it has found a good solution for pulling groups of friends and like-minded players together in the meantime, at least until it can put a suitable Guild system in place following release. BioWare has provided no ETA on when the Alliance system will be expanded to include Guilds, but given how quickly the studio implemented Launch Bay, a 16-player social space that arrived only after fans requested it, there’s a good chance this feature will appear sooner rather than later – particularly once players start hitting against the end game and start investigating the world-shifting cataclysms. Anthem is the new action-RPG from Mass Effect and Dragon Age developer BioWare. Click here to read our in-depth breakdown of the upcoming release with game director Jon Warner.